Yeah, we've all been there with finishes. Black is my curse, an EXA-1 where the dingotone didn't behave and a Black LP that sits unfinished in its box. Mocking me. 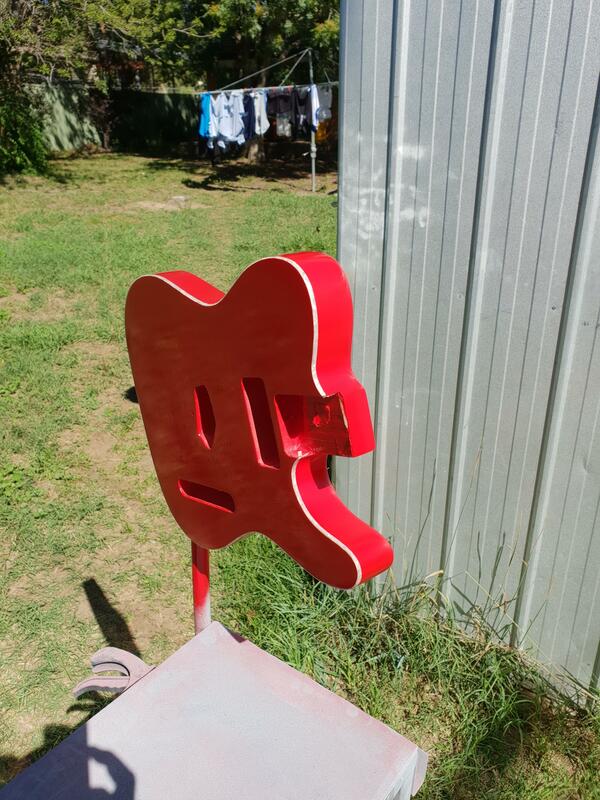 On the plus side, red guitars play faster! Yep and I can't let it go because then I feel like I wasted money if it's not perfect haha. There are two things that I've decided I need if I was doing lots of builds. A really clean booth to spray in and a spray gun instead of aerosols. Well the clear is sprayed. There are a couple little blemishes but unless I discover something more major when I inspect it after it has dried I'm just going to have to make peace with the fact it's not perfect. Anyway here are a couple of photos. And a close up of the binding that I put on there after I removed the factory plain white binding. I'll give it a week to dry and then I'll wet sand and polish to remove the orange peel. Fingers crossed I don't sand through the clear. Looks pretty good! Amazing what a cut and polish will do to reduce the look of little errors. Binding looks cool, nice to see something a little different. This thread has been a real roller coaster ride; all 3 iterations of this guitar have been stunning. That pearl binding looks great. Good luck with the sand & polish! So after my previous post where I removed the veneer I thought quite a bit about which way to go from there. 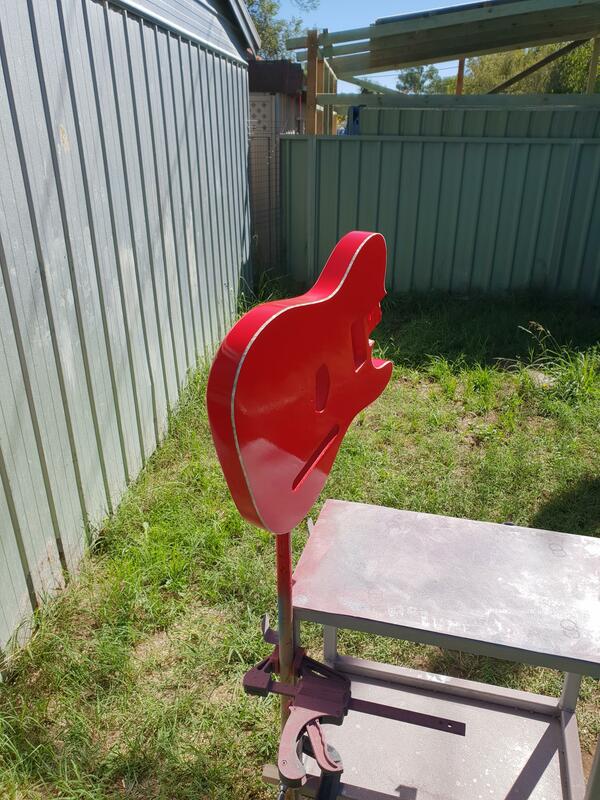 In the end I decided that I'd have a go at a solid colour finish. 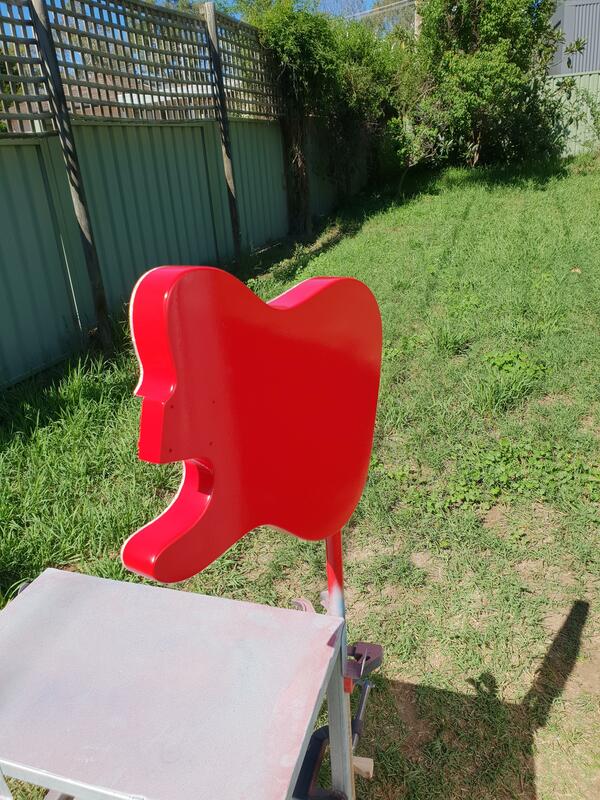 So more sanding to remove the lacquer and most of the colour from the rest of the body. 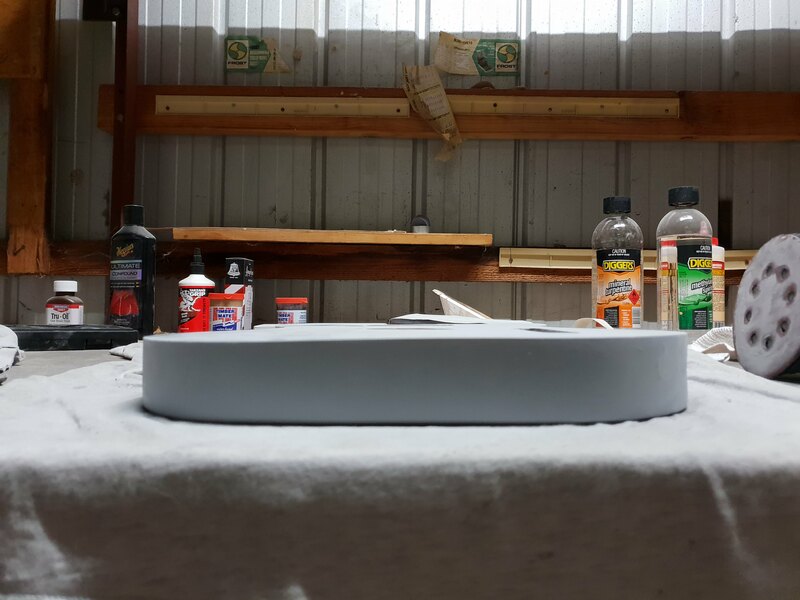 Then grain filled and now ready to spray some primer. Somehow I had managed to concentrate on one area too much while sanding and unintentionally create like a mini arm cut. Pulled out the calipers and measured the difference to check it wasn't my imagination. Now I'm thinking, what do I do now given I don't have that many tools. I contemplated things like thicknessing the body (assuming I could find somewhere that had a thicknesser) and then gluing on a cap. In the end I pulled out my hand planes first to have a go at getting it close to level and see how things went. After some careful work with the planes and then a little sanding it was looking very close to level again. I then test fitted the control plate to check the clearance for my switch. As I suspected I no longer had enough clearance. So out with the dremel and increased the depth of the cavity slightly. Neck pocket at this stage I'm hoping won't need any modification. 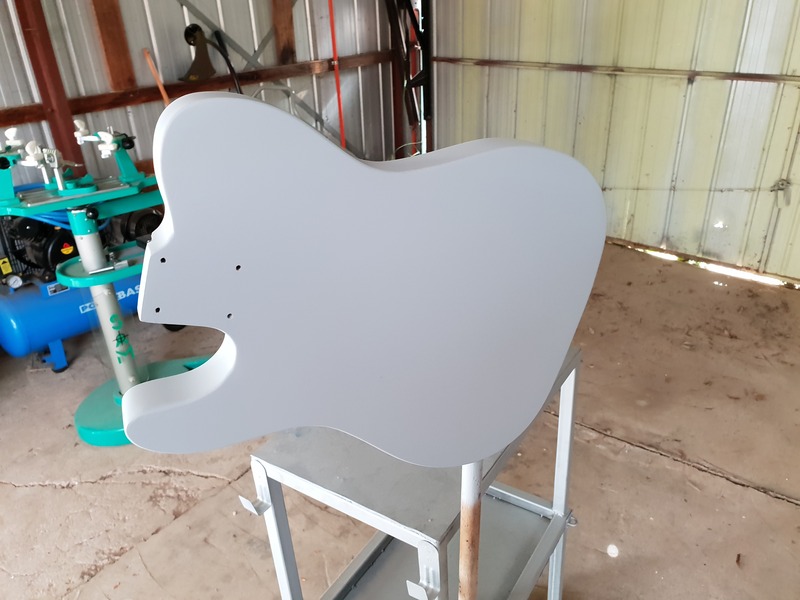 Time for some primer again and then sanding. 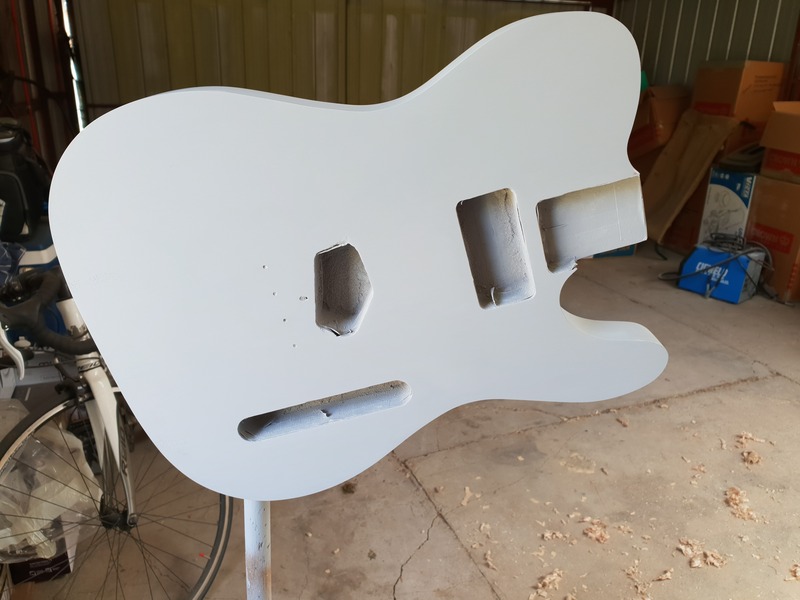 All sanded and ready for colour. And here's the colour (it is Ford Nitro Mica). It's been a frustrating couple of weeks and even now, despite putting a lot of work into the body, I have a couple little blemishes on the front but I have decided to accept that. It's my first attempt and I'm doing the best I can with whilst learning along the way. I'll let it dry and then scrape the bindings before the I spray the clear. I may have to gently sand the body as well to remove a couple of droplets that have landed on the body. What grit do people usually use at this point? I have use 800 to sand off drops and drips. I don't do the whole body, just the drip itself. 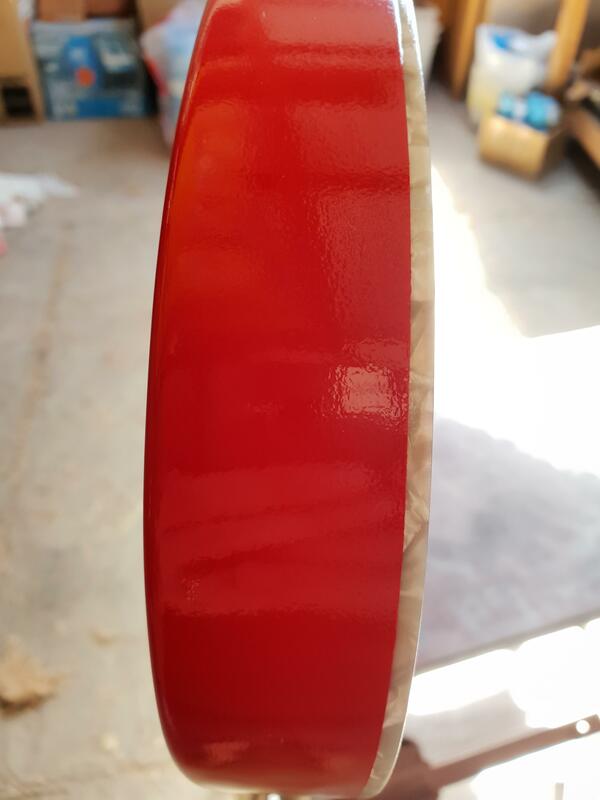 Cut a long thin strip of 800, maybe 6-8 cm long but only as wide as the drip, or a little less. Best to practice a bit on some scrap first and get your pressure and 'steering' right. I'm a bit late to the party, and was loving the blue !! That new binding looks beautiful ! Last edited by wcieslik; 11-02-2019 at 10:38 AM. 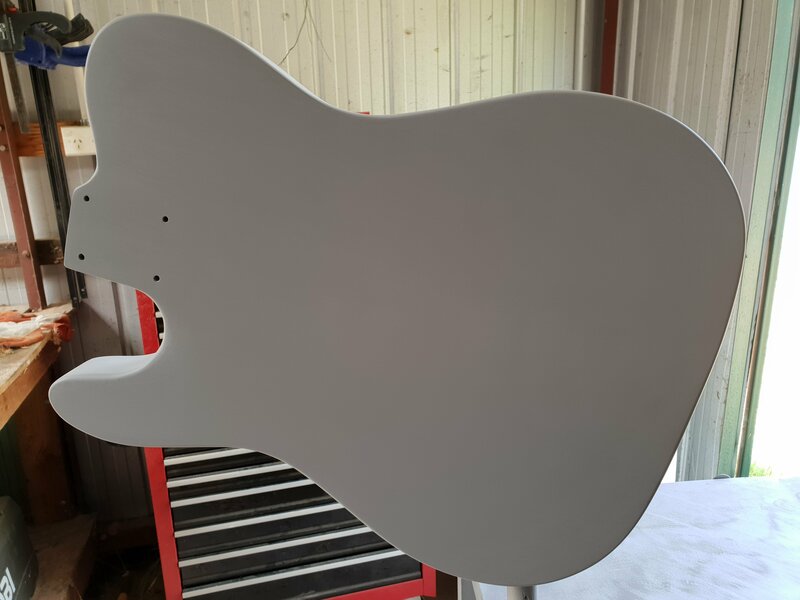 I went with that binding because I have a white pearl pickguard for it as well. Hopefully those elements of white pearl combined with the chrome hardware and the Emporer Red Pearl paint it'll come out nice. Probably not GOTM but a reasonable first effort after the setbacks. Haha trv you're telling me. I thought about getting a waterslide headstock decal saying "Patience" because it has certainly tested mine. Thanks wcieslik. 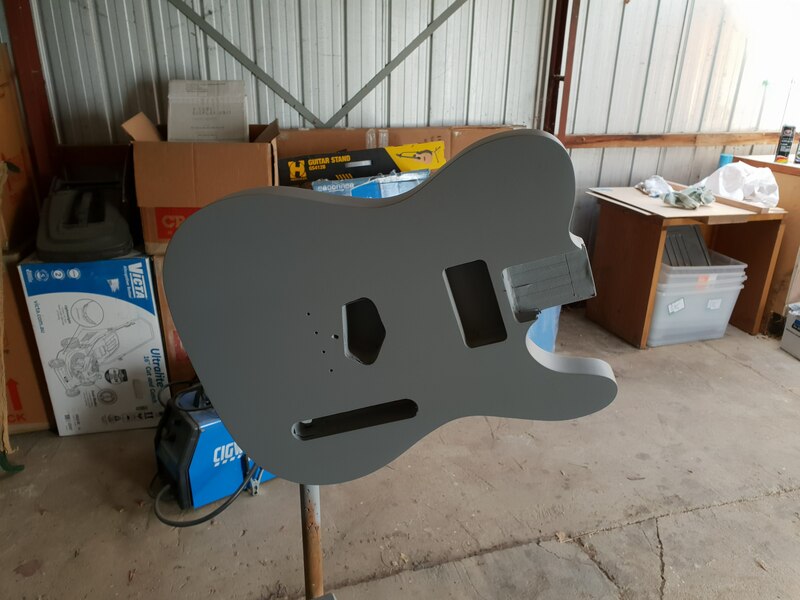 I'll definitely keep that in mind for when I do a black strat for my wife at some point. Oh and the blue was just a can from SCA. Hi Woltz, Epic build. I feel your pain as I had one that took me all last year to do.... and stuff up, redo, more stuff ups, etc. Hey what was the blue dye/stain you used on the original maple? I loved that finish!! 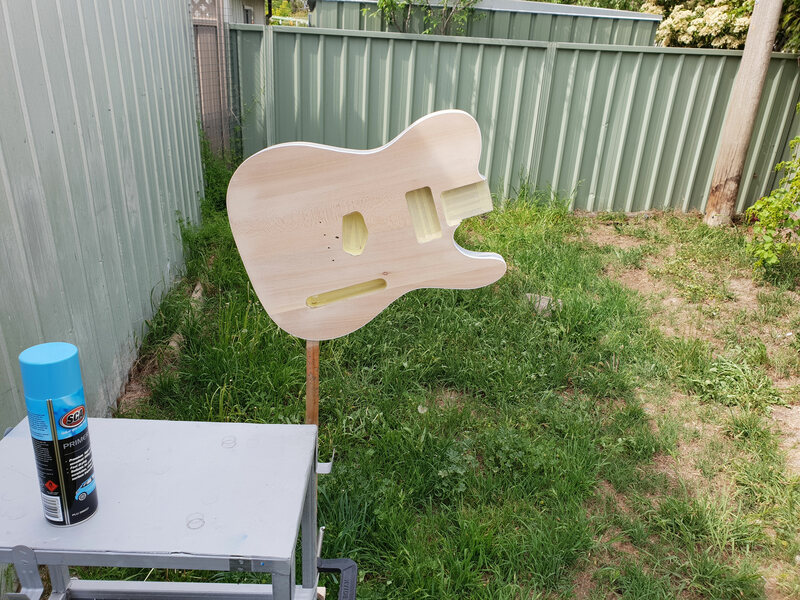 I'm about to start on a flame maple Thinline and that was one of my choices of colour. The first version I did Ebony Timbermate to highlight the grain then sanded back (very carefully on the veneer), then Angelus Blue (040) Leather Dye to stain. 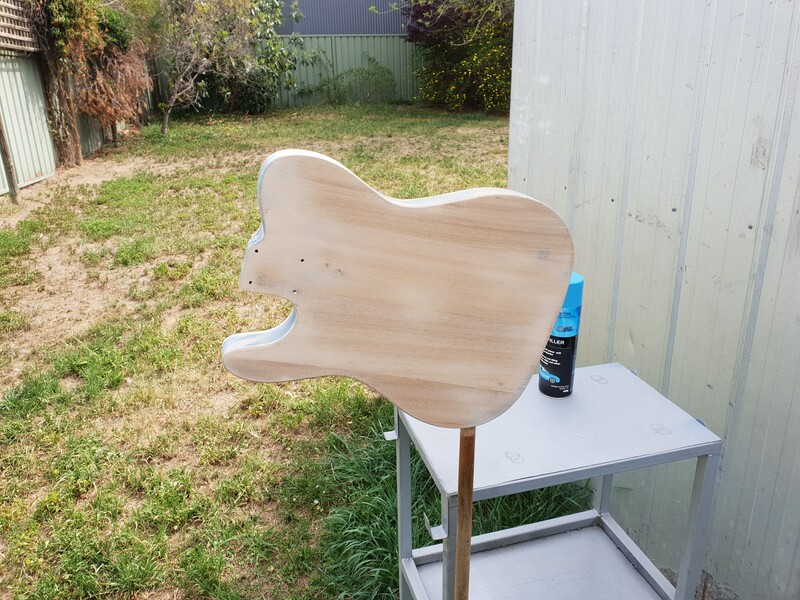 Then I sprayed with sanding sealer (Behlen Jey Spray Sanding Sealer) and sanded to get it level before I sprayed the nitro clear (Behlen Jet Spray Clear Lacquer). 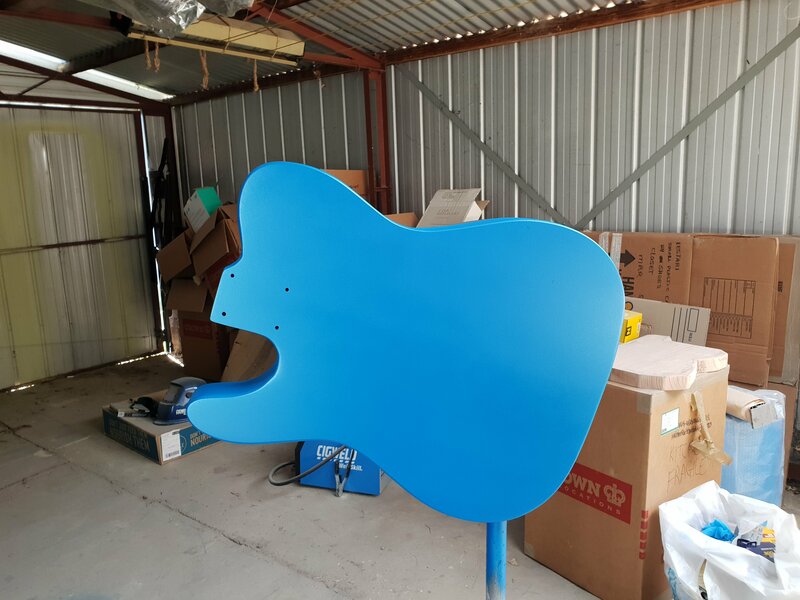 The spot where I made the error was I should've done more coats/thicker coats of the Sanding Sealer and then block sanded more to be sure it was flat before I sprayed the clear coat. Are you in Australia? 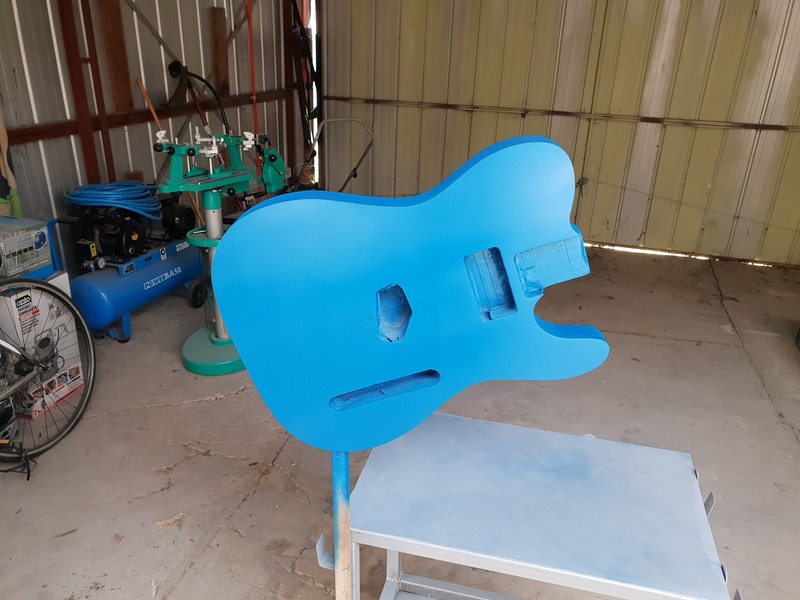 I got the leather dye off ebay (although also available from Adelaide Leather & Saddery Supplies) and the nitro aerosols from guitarAust. Thanks Woltz. Yes, I'm in Oz. I'll check out the dye. The one I'm trying just isn't doing it for me!! This guy goes through a large number of the Angelus Leather Dye colours so you can see what they look like.